When it comes to the diet of sharks, many people have the misconception that they are out there hunting for humans and such. That simply isn’t the case, and what they eat depends on the species and their location. There are some species of sharks such as the Great White that are carnivorous. They are aggressive predators in their environment. Other species of sharks, namely the larger ones, are filter feeders. They use suction to help them get plankton and small fish. They have a filtering system so that water and debris is filtered out and the food is what they get into their bodies. They may spend many hours per day feeding in order to get enough. Many experts believe that megamouth sharks are able to attract food sources to them due to the luminescent tissue that is found inside of their mouths. This makes it easier for them to get food without their prey having any indication that they should be running the other direction. You will notice that filter feeding fish have smaller teeth than those that are carnivorous. One of the types of feeders that we don’t hear much about are called cookie cutter sharks. They are feeding on pieces of flesh that are out of large fish and other aquatic mammals. They have very large teeth that are also sharp. They consume their food by latching onto it then using their lips to rip off pieces of flesh from the body of the prey. There are various shark species that are very good at ambushing their prey, such as Angel Sharks. They are able to blend in well to their surroundings and wait for prey to come along. The element of surprise is to their benefit. Squid and small fish are often swallowed whole by various species of sharks. Research shows that some species of sharks will hunt in groups so that they can surround the prey from all directions. This allows them to have no escape and the sharks can feed heavily from those schools of fish they have surrounded. Sharks are very intelligent and they have been observed modifying their feeding habits in order to get them the best outcome. When food sources are hard to come by, sharks can become very aggressive and territorial towards each other. They may also start to explore beyond their natural home range in order to secure food in order to survive. While sharks do need a great deal of food to survive, many of the species can go for weeks or months without food if they have to. However, it is instinctive for them to feed daily as much as they can. High levels of stress can occur when food is scarce and it can also result in reduced mating taking place. 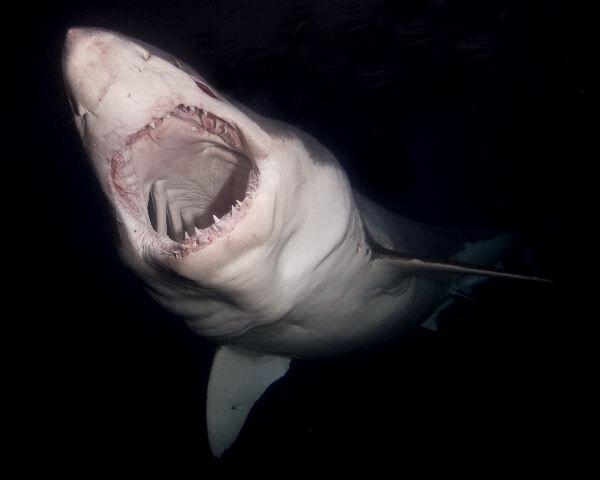 While young sharks have small teeth, they too are hunting and eating the various food sources for their species. What sharks have access to though often depends on their environment (climate and water temperature). This is why some species of sharks are significantly different in size from one area to the next. What is very interesting about the feeding habits of sharks is that it does take them a very long time to properly digest their food. The stomach is shaped like a J and that is where the food they consume is initially going to be stored. The intestines of a shark are shorter than mammals species and also plays a role in the time to fully digest what they consume.